Keep Insects Away from Your Lawn and Home! It’s mid-summer and bugs are everywhere! If you’re not running into them outside, you might be waking up to find a centipede on your wall or ants in your kitchen. How do these creepy-critters manage to be everywhere? And more importantly, what can you do to keep them out of your home and yard? 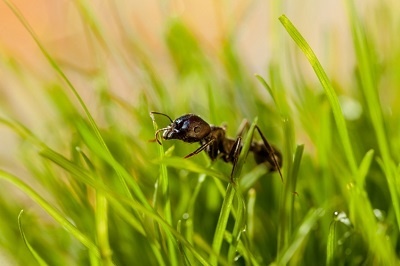 Ants, ticks, fleas, and many other types of bugs tend to show up in your yard and home over the summer. Not all these bugs are dangerous, but some can be whether its to your lawn or to your family and pets. You may wonder why so many of these insects keep coming around even after you work to get rid of them. This is because most insects leave pheromone trail behind, which attracts others to come around. Luckily, Weed Pro can help keep both your lawn and family safe from all types of bugs that may be around! To protect your lawn, we offer a Surface Insect Control Spray. This treatment will remove any insects that are currently present in your lawn, as well as prevent any more from coming around. The best part is that it will not only kill any insects that come into contact with the spray, but it will also eliminate that pheromone trail that attracts more insects. With that pheromone trail gone, your lawn will be safe from any pests and the damage they bring! To protect your home, we offer a Home Perimeter Pest Spray. This treatment works similarly to the Surface Insect Control. The spray creates a protective shield around your home that will prevent any bugs from coming in and out of your home. It also removes that pheromone trail that gets left behind, so no new insects will be tempted to make their way to your home! What’s the best part about these treatments? They are completely safe to people and pets! Want to learn more about them? Click here to learn more about the Surface Insect Control and here for the Home Perimeter Pest Spray. You can also receive a FREE estimate from us today! Just click below to get your free estimate!